Sachin Tendulkar and Harbhajan Singh spent a day at the NSG headquarters at Manesar to honour the courage and sacrifice of National Security Guard commandos during the 26/11 Mumbai attacks,also interacted the with the commandos who participated in the terror operation at Taj and Oberoi hotels. 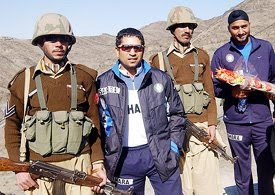 While chatting with commando,an emotional Tendulkar said,Without a doubt it's you guys who are the real heroes, we just play cricket,you play with your life so that we are secure, I salute and your families because they have an important role in your sacrifice. It's truly an honour for both of us to be here and see what all of you are doing.Your hard work and contribution to the nation can never be compared with that of an actor or a sportsman. Although we always give our best to keep the nation flag high but our contribution in front of yours is much less in comparison to your contribution to our Nation. We are the role models for many people but we are proud to say that you are our role models. The duo also witnessed the Anti Terrorist Conditioning Course, which the commandos undergo in almost real life terror situations.Tendulkar and Harbhajan also tried their hand at the tough 26 obstacle training course of the commandos, which includes jumping from heights,climbing heights,etc.